National Women’s Health and Fitness Day is a annual observance that promotes the health and fitness of women of all ages. This yearly event encourages all women to make healthy lifestyle changes and to take charge of their health and fitness. For senior women, National Women’s Health and Fitness Day can be a day to try something new, start new healthy habits, and get in on the fun of a National Women’s Health and Fitness Day community event. Taking care of health and staying active is very important for senior women as it can help them to prevent serious medical conditions that affect women such as osteoporosis, different types of cancer, heart disease, and diabetes. Read on for some ways your senior loved one can participate in National Women’s Health and Fitness Day this year. Check online to see if there will be a community even taking place this September 28th in your town. Locations such as malls, fitness centers, parks, and more may be hosting fun and informative events such as community walks, health fairs, health screenings, and group fitness classes that are open to the public. 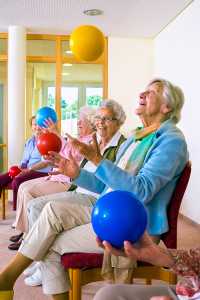 These are fun events to participate in and they will give your senior loved one the opportunity to learn about health topics, meet up with friends, and engage in an active activity. If your senior loved one is looking for a fun activity to do with friends that can be continued all year long, suggest that they start a walking group. Walking with a group of friends is a great way to get much needed social interaction and it is also a great activity to do for health. Walking is an excellent form of exercise that is easy to do just about anywhere. Women’s Health and Fitness Day is a good time to check in with your loved one to see if they are up to date on all of their screenings, vaccines, and other check ups that they need. If they are not, it is a great time to make the necessary appointments. Remember, by getting preventative doctor visits, screenings, and vaccines, your loved one will be taking charge of their health and potentially preventing serious medical conditions. This entry was posted in Senior Care Collierville TN and tagged Senior Care Collierville TN. Bookmark the permalink.